Allie's Smokehouse Bac'n Cheese Burger packs in all the classic flavors, but with none of the animal. A few months ago my partner and I made the hasty decision to go vegan, or at least vegan-ish. The effort, semi-successful so far, led to my exploring areas on local menus I once would have skipped right over in favor of something delicious that once moo-ed, oink-ed or baa-ed, now stuffed in a bun and covered with cheese and assorted condiments. 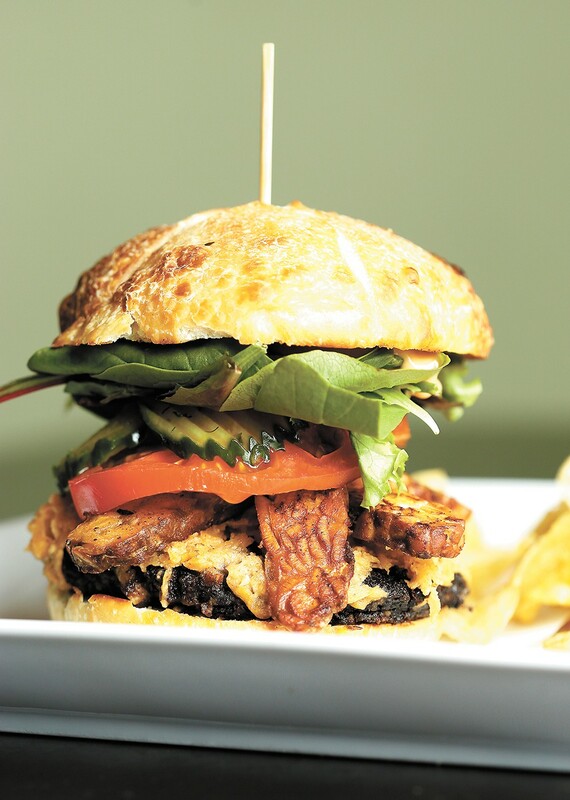 Thankfully, going the Way of the Vegetable doesn't mean foregoing burgers, and most places in the Inland Northwest at least have some veggie burger option, whether that "burger" is made of beans, beets, rice, mushrooms or some other meat substitute. This pleasant spot on Spokane's lower South Hill serves up the kind of veggie burger that makes it easy to eschew beef. The Allie's menu is all vegan all the time, and a skeptic might consider the idea of a vegan "bacon cheeseburger" absurd, but this bad boy utterly satisfies. The patty — a combination of brown rice, black beans and sunflower seeds — holds together remarkably well without being squishy, and the cashew cheese and tempeh "bac'n" do just fine as substitutes for the real thing. Add some vegan BBQ mayo, lettuce and tomato and you have a classic bacon-cheese served on a fluffy bun with a side of chips or potato salad. If you like to keep things simpler or free of bacon flavor, Allie's also has a straightforward Black Bean Burger served with chipotle mayo, cilantro and tomato for just $8. This relatively new North Side spot is quickly making a name for itself for vegetarian and vegan options, among a creative menu of omnivore- and pub-friendly comfort food staples. And while their Impossible Burger (see story on page 30), a plant-based patty that tastes remarkably like beef, is getting a lot of buzz, I prefer the bright red Bean Beet Burger. It's a monster — seriously, splitting it between two people is a wise decision — and makes a nice base for a slew of fresh toppings like slices of red onion, butter lettuce, tomato and cilantro. Add a dollop of vegan chipotle aioli to the Alpine Bakery Bun and you're in business with a burger unlike any other in town. There are many reasons to visit this Kendall Yards gem, from the patio views overlooking the Spokane River to a menu dotted with house-smoked meats and the incredible country bread that's a meal unto itself. This flavorful burger is a consistent highlight thanks to a chickpea patty seasoned with an array of Mediterranean spices (and more than a little garlic, it seems) and topped with fresh cilantro, butter lettuce, herb mayo and a brioche bun that is almost worth the price on its own. Be forewarned: Grab your burger too hard when you're hungry and the patty might squeeze out the side of the bun. But not to worry, it will maintain its structural integrity enough for you to pick up the chunk to savor that last bun-free bite. The original print version of this article was headlined "Beefy Burgers (sans Beef)"